Why Use a Track﻿ Planning Professional? Would you start construction of a new house without an accurate professionally designed floor plan? Obviously, not. Why would you start building a model railroad without a well designed, well thought out track plan? My designs are interesting, but not overly complicated. If need be, I can design complex multiple level plans. My passion is designing track plans for individuals whose first layout [probably] turned out less than optimal. You'll find my designs fun to build, fun to operate, and most important, they won't become boring after a few years. 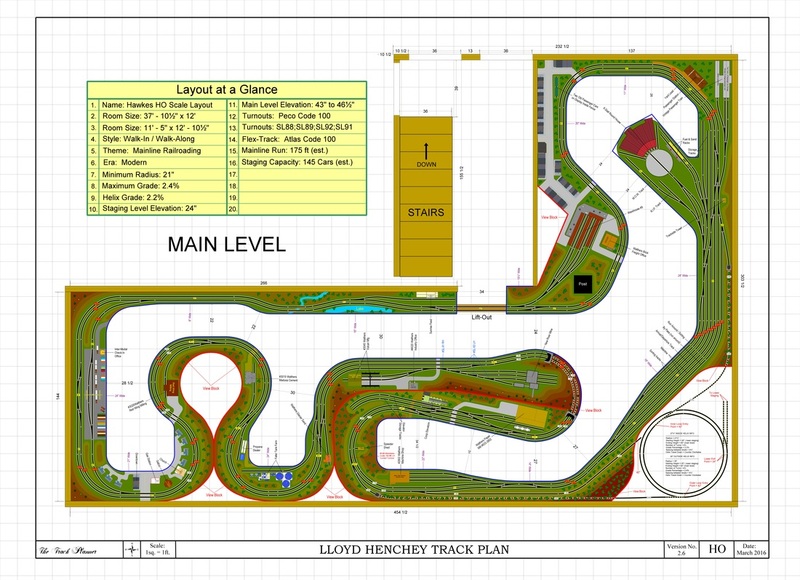 By purchasing a custom designed track plan, you can take pride in the fact, you built a layout based on prototypical operations. I design a track plans, specifically tailored to the clients needs. The design will include many if not all of the seven design elements described below. You will end up with a design that is well thought out and will operate like a real railroad. 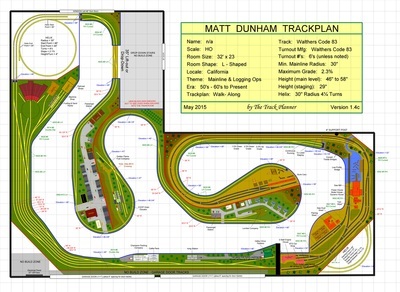 I firmly believe a custom designed track plan, will save you time & money, while giving you many years of enjoyment! #1. Walk-Along Mainlines... I feel this element is the most important and why I have it listed first. With the advancements in electronics and the quality of today's equipment, model railroads should be designed to mimic real railroads. Designing walk-along mainlines not only creates a visually stunning look, but also let's operators "operate" their trains in a prototypical manner. Walking with your train, gives the operator the feeling of physically and mentally going somewhere. The hardest elements to emulate on a model railroad is time and distance. Walk-along mainlines substantially improve this feeling. #2. Narrow Benchwork... This element is important for the overall comfort when building and operating the layout. Narrow benchwork makes building and working on the layout easier. Narrow benchwork also helps reduce pinch-points in aisle ways. While not always possible, I try to avoid reach-ins longer than 36", which is the maximum comfortable limit, for the average adult. Most of my designs have benchwork in the 12 " to 30" range. #3. Long Mainline Runs... Having long mainline runs, incorporated with the walk-along element, reinforces the operators feeling of "going somewhere". If space permits, designing track plans with multiple peninsulas maximizes mainline runs. Layouts designed with peninsulas and long mainline runs, feel larger and can be operated like the prototype. #4. Trains Traveling Through Scenes Once... This element is very important in increases the feeling of time and distance. More importantly, it creates the illusion, your models are real trains and there is a reason for them traversing the layout. When trains leave staging (see element #6) or a yard, and traverses the layout once, the operators tend to forget their operating a model. The feeling is "I'm operating a real train and I'm actually "coming from" or "going to" somewhere. The term I like is "thinking beyond the basement". #5. Peninsulas with View Blocks... View blocks are a great tool to help create the illusion of time and distance. View blocks prevent operators from seeing anything other then what is directly in front of them. As the operator walks with his train, he only sees the landscape his train is currently passing through. The opposite side of the peninsula, while only a few feet away, can feel like miles away by incorporating view blocks and peninsulas. #6. Staging Yards... If a model railroad is to operate like the prototype, staging yards are a necessity. Trains need places "to go" and places "to come from". By combining staging yards, traveling through scenes once and long mainline runs, you've created a "mini-transportation system", not just a model railroad. Again, think in terms of "beyond the basement". #7. Prototypical Operations... Model railroads that have been around for decades, usually have a common theme. They can be operated like the real railroads. I pride myself in being able to create, not only a beautiful looking track plan, but a track plan that can be built and operated like the prototype. I like to think in terms of designing "mini-transportation systems". I understand how real railroads operate and I try to incorporate prototypical operations into every design I do. Designing a track plan incorporating the seven design elements, it becomes almost mandatory to use some type of CAD track planning software. CAD based software will guarantee everything will fit and operate as designed. Most individuals are easily intimated by CAD drawing software. That is where "The Track Planner" can help. When you purchase a custom designed track plan from me, you can rest assured the design will fit the available space and will operate as drawn. You can go to my Gallery page to see additional examples. You can go to my Referral page, to read some of the testimonials and feel free to contact any of the individuals listed. Model railroaders who are thinking about using my services, will have to decide if the cost of a well thought out, well designed, operations oriented track plan is worth the investment. For about the cost of two quality sound locomotives, I can design a customized track plan that will operate prototypical, fit the available space and save the modeler time, frustration and $$$! In my opinion, it is one of the best investments a newbie or seasoned modeler can make. Go to the Getting Started page and find out how to get started having me design your own customized track plan.